While celebrating the fourth year of the now official website Catherine de Montsalvy, I thought I should finally have also the courage to add our most admired MARION SARRAUT to the list of AWARD winners! Dear Dame Marion as I call her to myself, has been with the Catherine site since the website was launched in 2008. When I found Marion Sarraut's address on the web, I never believed that such a grande Dame would answer an unknown and unimportant new website webmaster! But... to my utter surprise I was answered - and not only that, Marion Sarraut took her time and wrote a magnificent and very touching comment in our Guest book! We must never forget that Dame Marion is a much acclaimed personality not only in France, but in the whole world! She has worked with famous directors and is the winner of such honnors as the « Chevalier de la Légion d'honneur, Chevalier des Art des letters (awarded by the Minister of Culture) » ! I am sure everyone can understand how great my joy and also gratitude was for that precious entry in my guest book! It is also one of the reasons why I have not exchanged it so far with something more easy to access ☺ ! Ever since this site exists, dear Marion has agreed to support all the projects which was in someway connected with the Catherine books or Juliette Benzoni. She responded the same hour I asked her if she wanted to join us to celebrate Juliette Benzoni's 90th birthday 2010 and also the following year 2011! October 2011 I saw to my delight, that there would be the possibilty to go and watch SOIF a stupendous play in Paris, with Corinne Touzet and Fred Nony. I took the train from Zürich - arrived at Gare de l'Est - was picked up by my dear friend Frédérique and by Métro we made our way to the theatre - admitting to ourselves that we were a tiny bit nervous to meet hopefully the ingenuous woman/director Marion Sarraut - the woman responsible that Juliette Benzoni had found her smile again, that through Marion Sarraut her books were brought to television as she had had imagined it! Marion Sarraut is an adorable and kind-hearted woman whom I hold in a very high esteem. 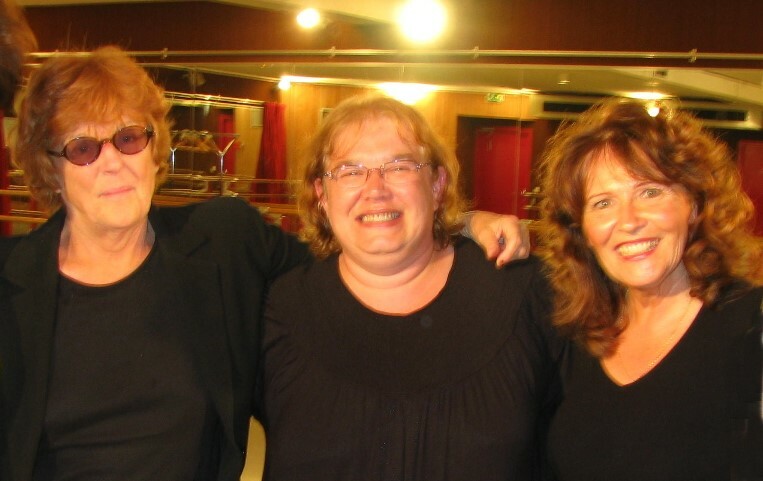 I shall never forget the surprised look in her eyes when she realized who those girls were, who almost run her over when she came out of a side door at the «Theatre du petit Saint-Martin ». Our joy when she recognized us - embraced us and invited us later on to come and have a quick drink with her at a nearby Bar, that will forever stay in my memory. 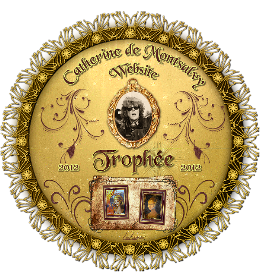 Dearest Dame Marion I know this Award is only a symbolic gesture from my site - but it comes from the heart - it is my way to say thank you for your generosity and your sweetness towards the Catherine de Montsalvy website and the fanbase of Juliette Benzonis world.